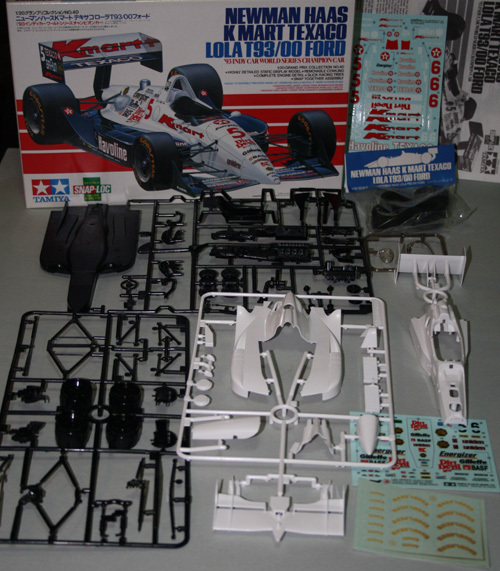 The next kit to build was selected from the stash simply because it was sitting on top of all the others! 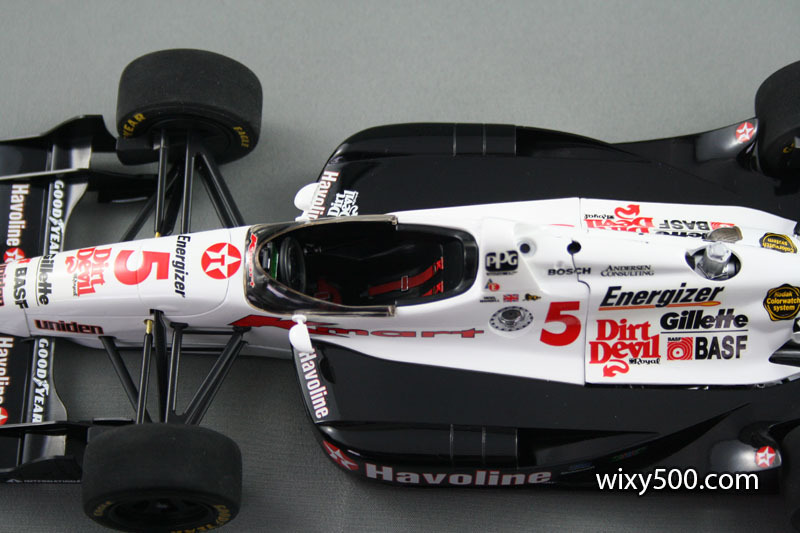 Tamiya’s 1:20 scale Lola Indycar in road course configuration. 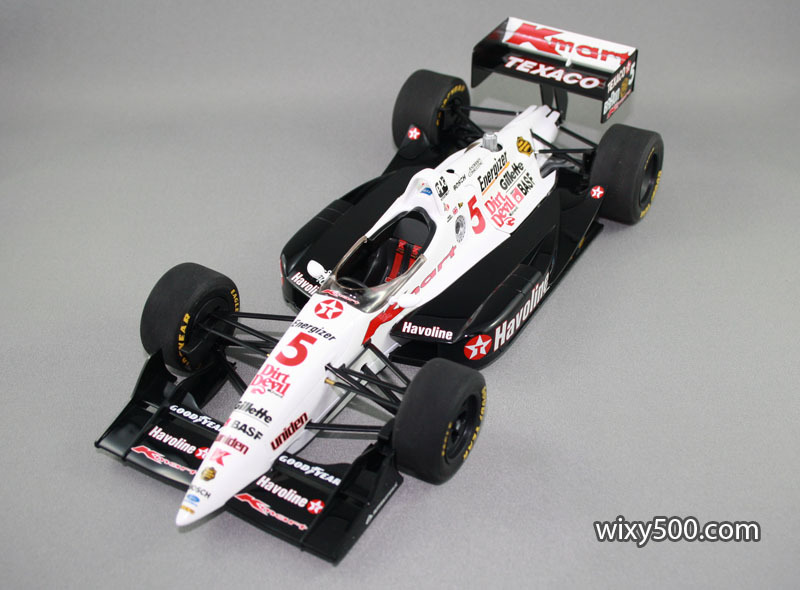 This was (mostly) built straight from the box to be Nigel Mansell’s Championship winner. 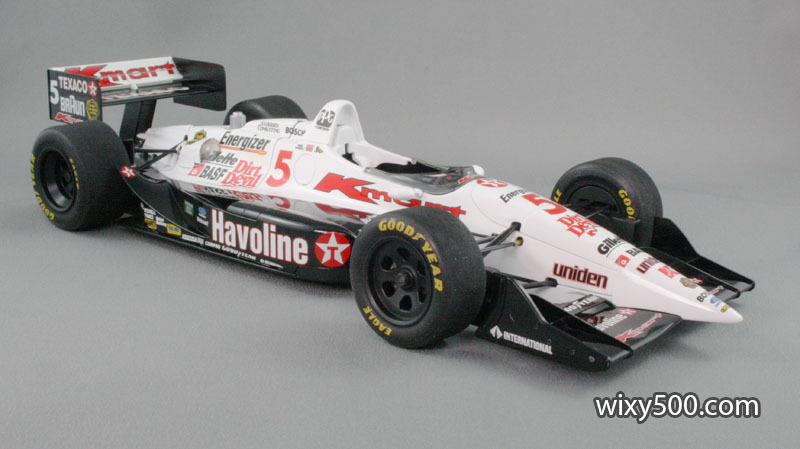 I was almost going to do Mario Andretti’s car (simply because he’s a Legend) but Nige got the nod because the Pom had a pretty remarkable rookie year in the CART series. 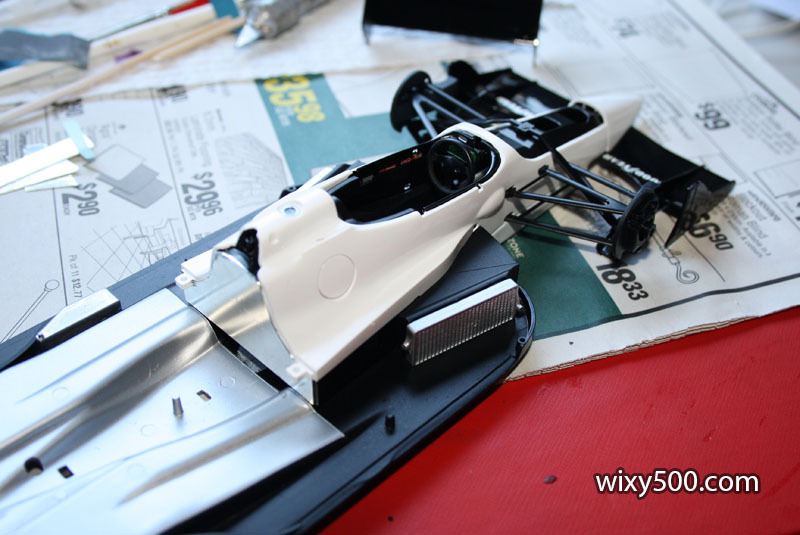 Major components of the bodywork test fit – being careful not to allow parts that clip in to actually clip in! 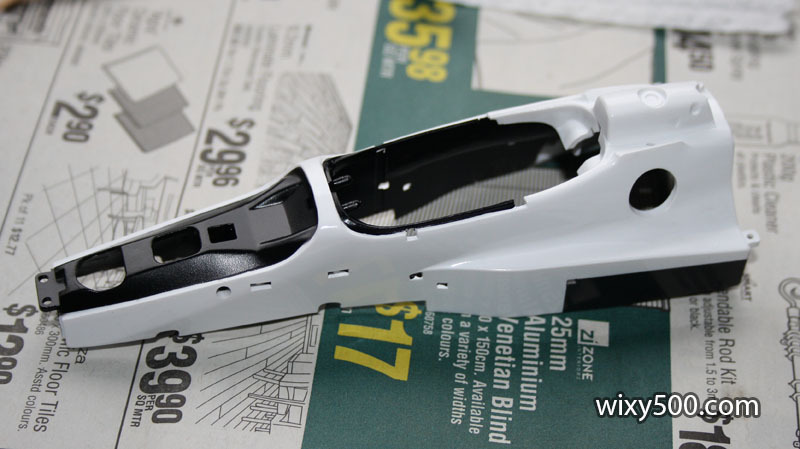 Smoothening out some mold lines on the tub, plus initial engine block and floortray work in the background. I’m not that impressed with some of the engine detail, so considered doing this as a curbside. 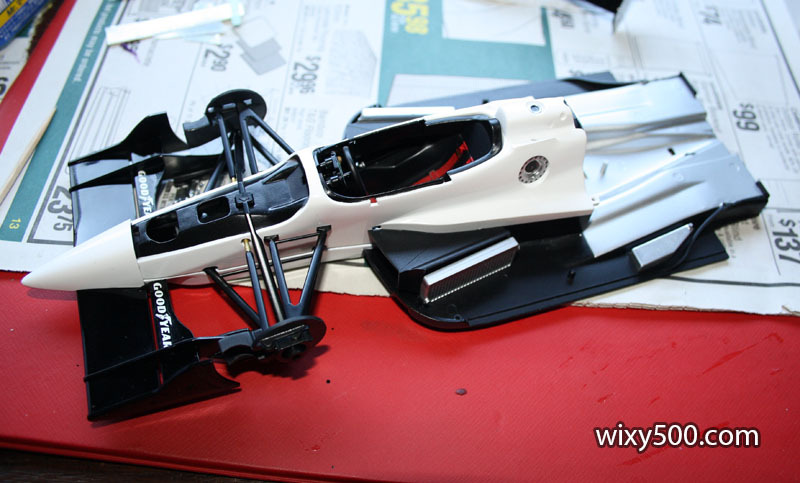 Engine/gearbox/rear suspension assembly is done. 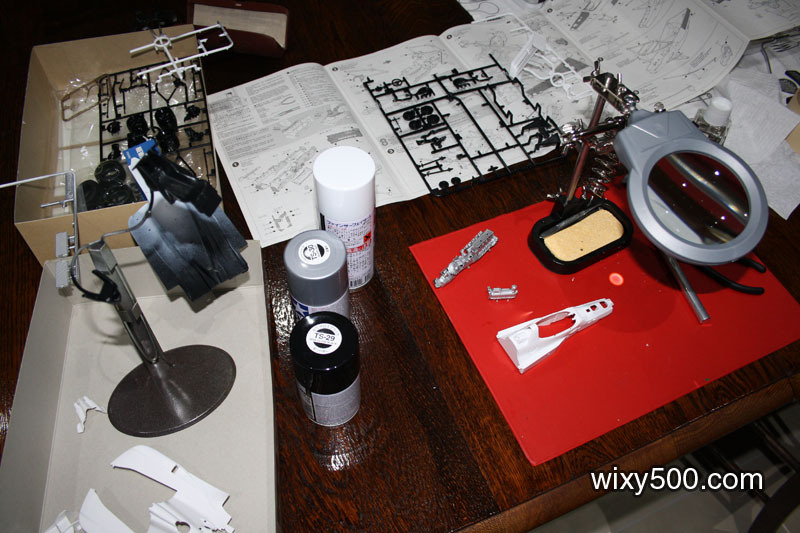 Seat, steering wheel/dash and various other pieces are painted and ready for assembly once the body and floor are complete. 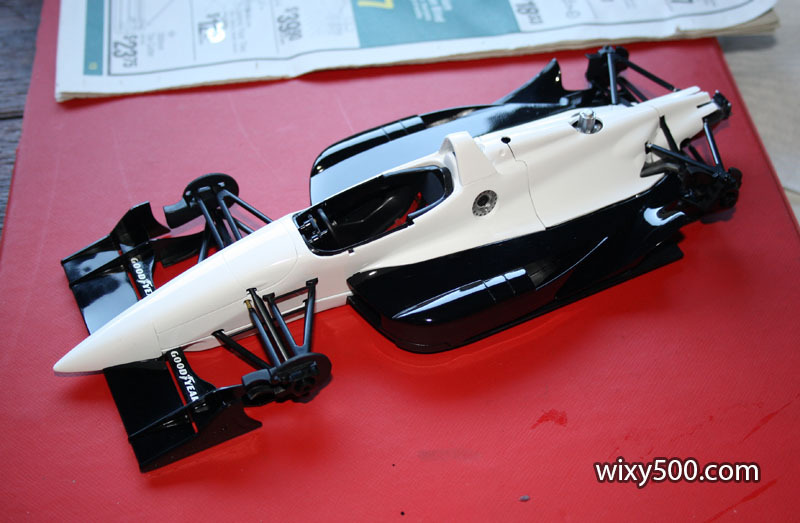 Monocoque after mask-spraying the top and side sections in semi-gloss black. Inside of the cockpit was brush painted. 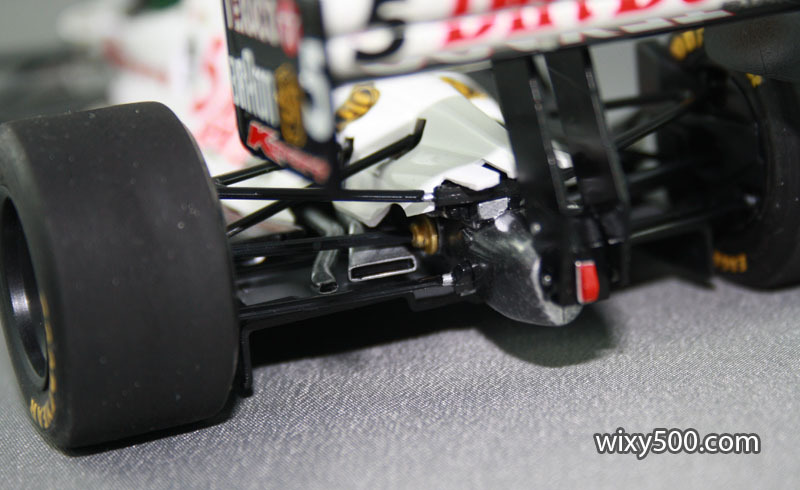 Engine/gearbox/rear suspension assembly, plus the radiators, clipped into the floor tray. 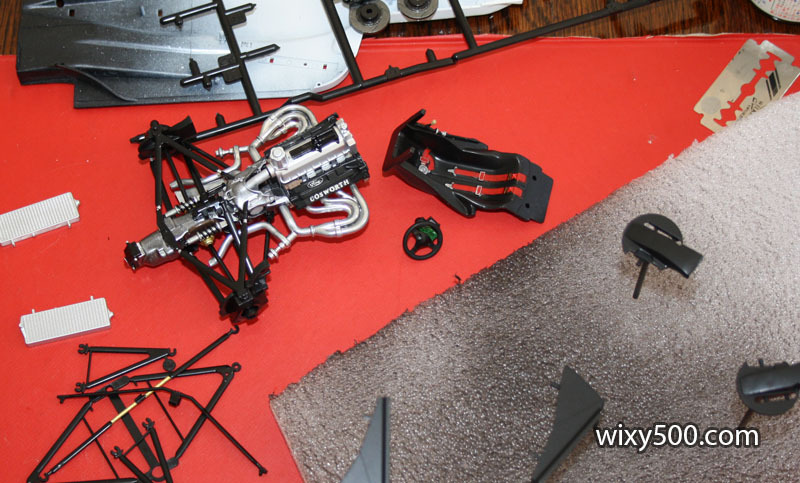 Assembly was fairly straight forward (though the engine has been removed here because I thought the tub had not fixed into position properly). 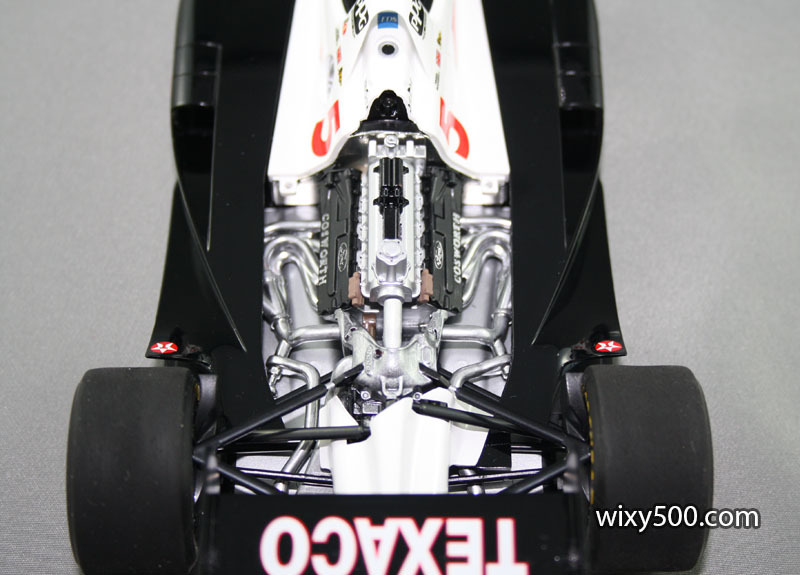 Front suspension is installed when the monocoque is attached to the floor tray. 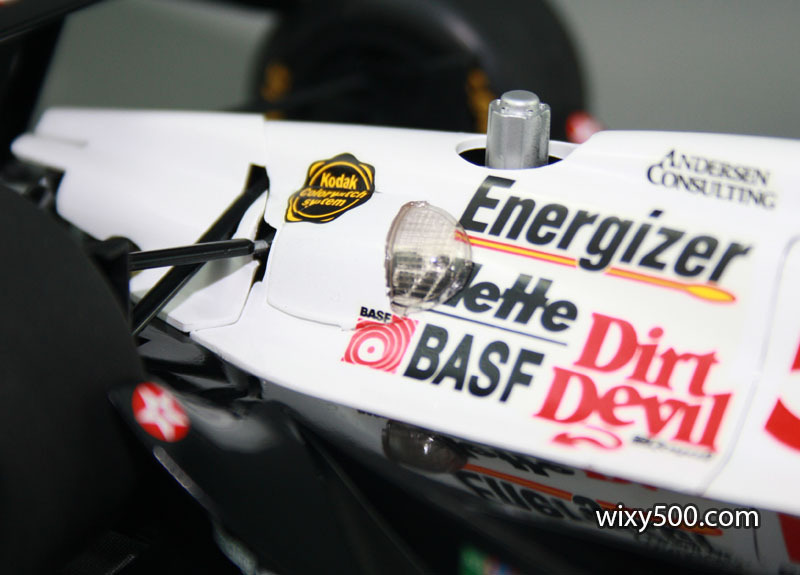 Front wing and nose cone then press into position. 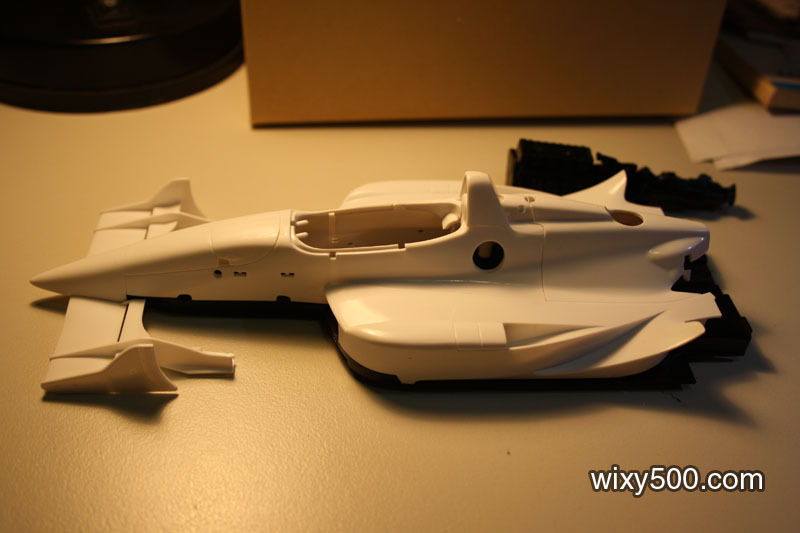 Unfortunately, because of the way Tamiya has produced this kit, there is a separation line running the length of the lower tub. Rear view of the tub (I used bare metal foil for the heat shield) after attachment to the floor. 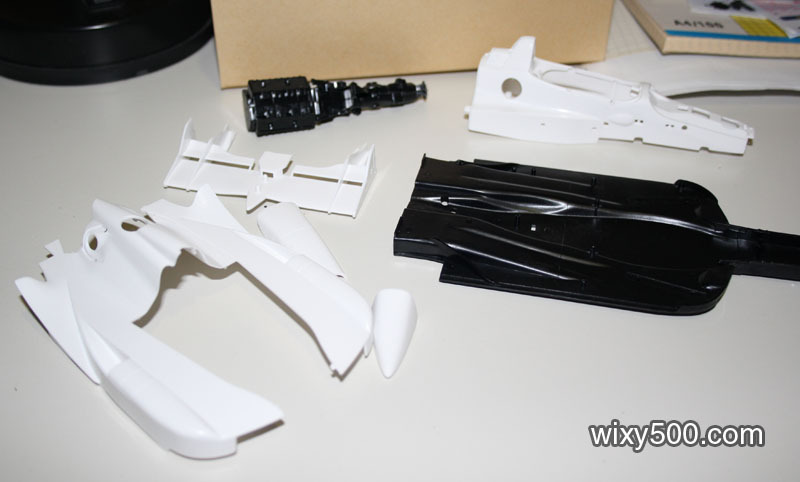 All the main parts are now together. 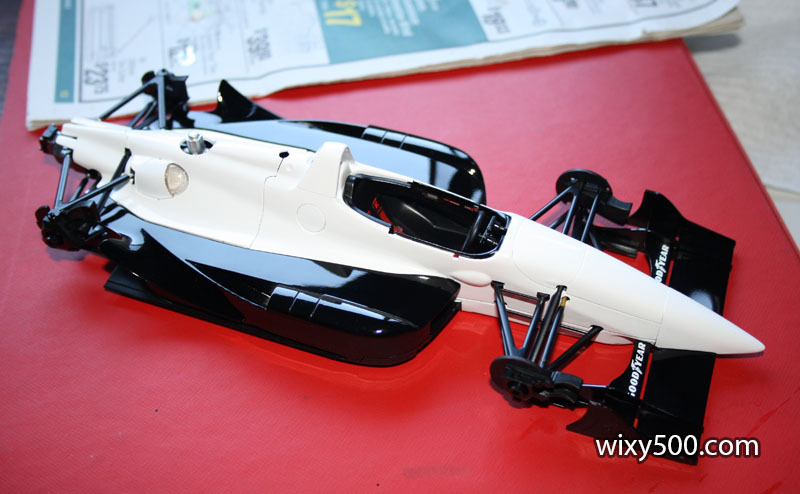 Just needs brakes, wheels, rear wing, windscreen, mirrors and the rest of the decals. The re-fueling side. 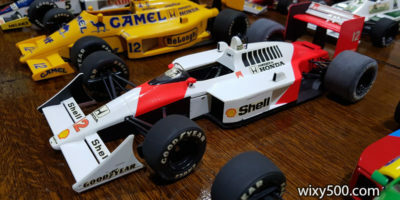 The kit allows the re-filling nozzle to be fitted either side (with a blank plug for the opposing side) so the modeler can build the car for a specific race if they wish. 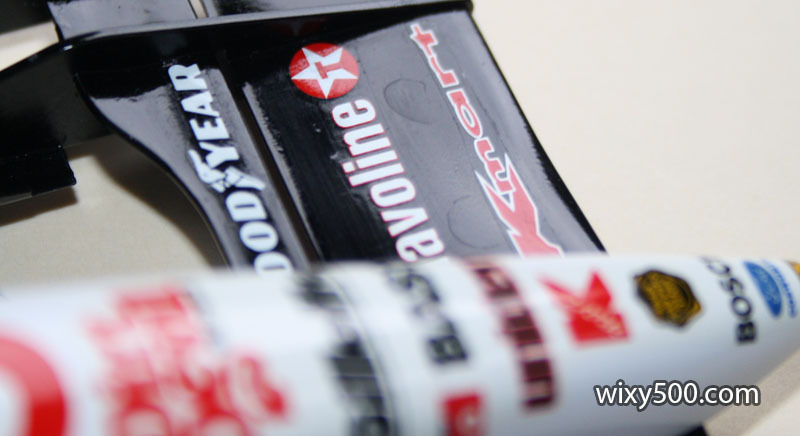 After applying the decals, there were a number of these weird watermark type blotches and adhesive mess which took a while to clean up. 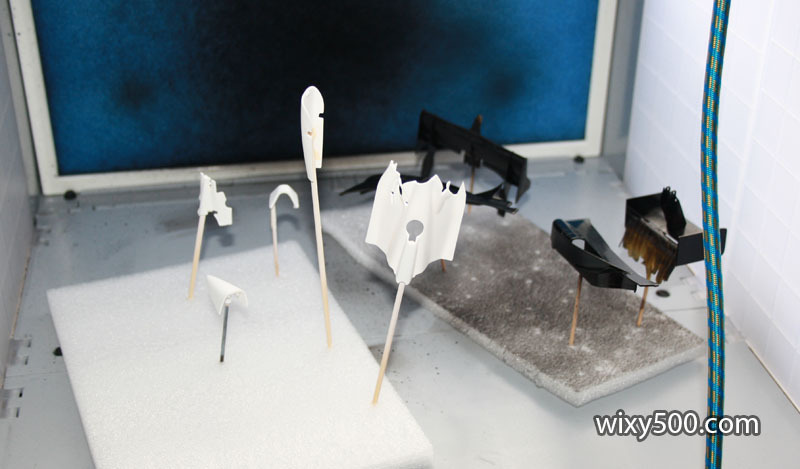 Once cleaned up, the stock decals are reasonably glossy (no clear coat on this model). 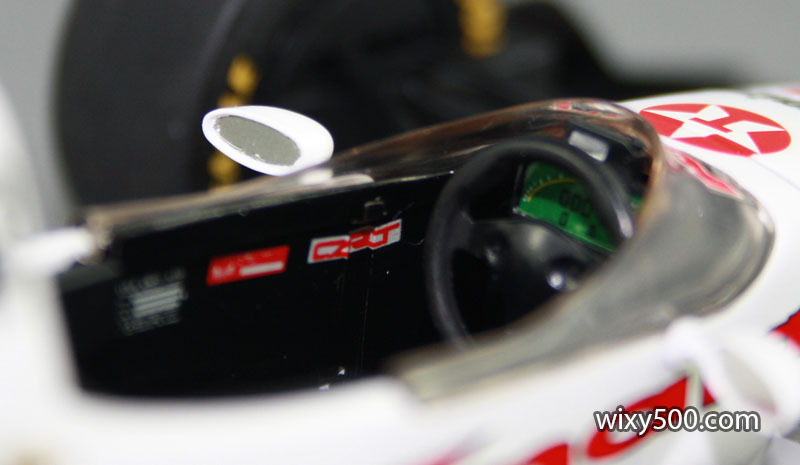 I was impressed with the fit of the shock/monocoque cover and nose cone compared with other areas of the model. 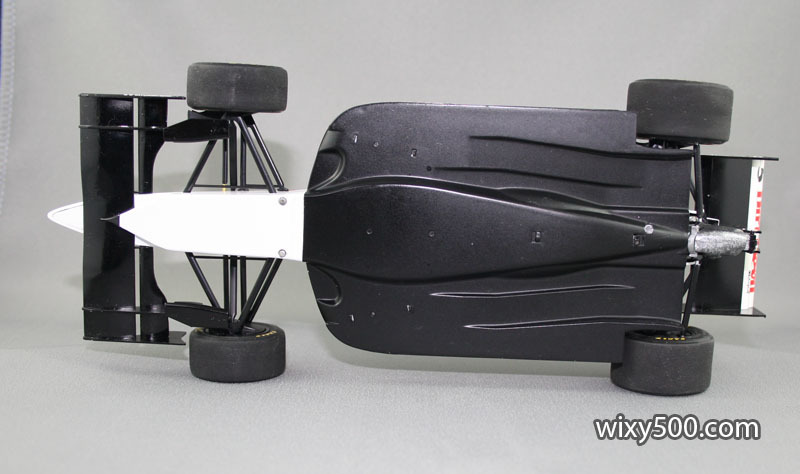 Curved underside shows the ground-effect venturis. 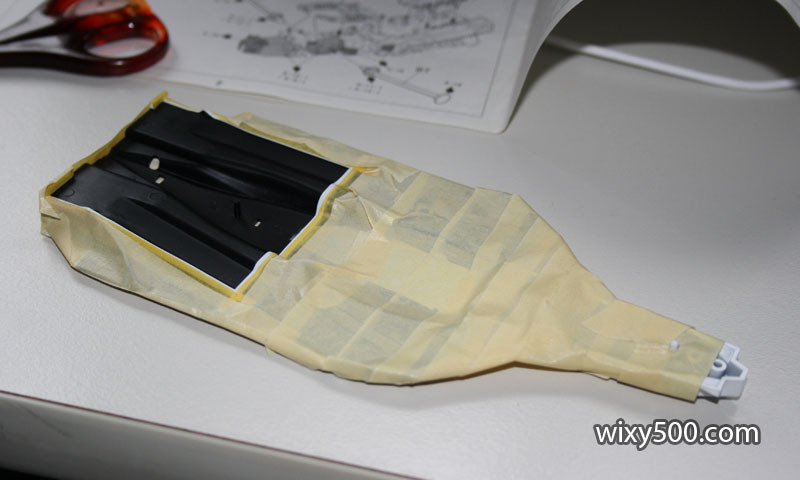 Also shows the holes where parts are clipped into the floor tray, such as the radiators and engine. Engine bay with the cover off. 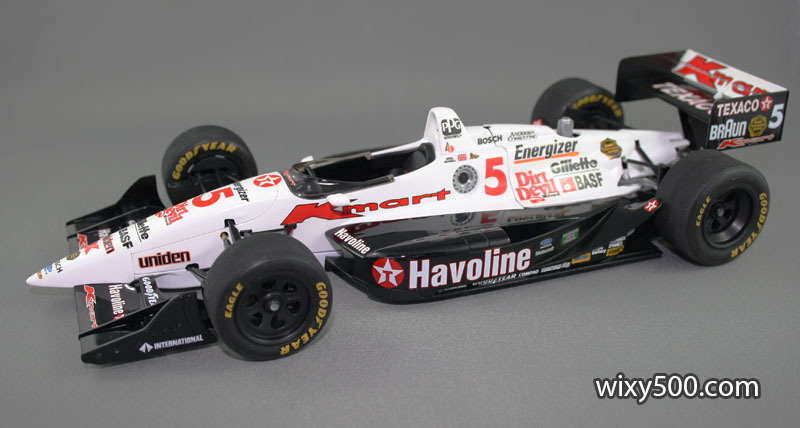 Accuracy of the turbos, bell-housing etc is not that flash when compared to photos of the real car. If this was not a Snap-Loc kit, I’m sure it would have been a better model. 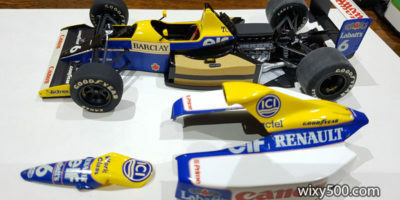 I refrained from doing this kit as a curbside, but glad I cut the sidepods off the engine cover so they can stay in place. 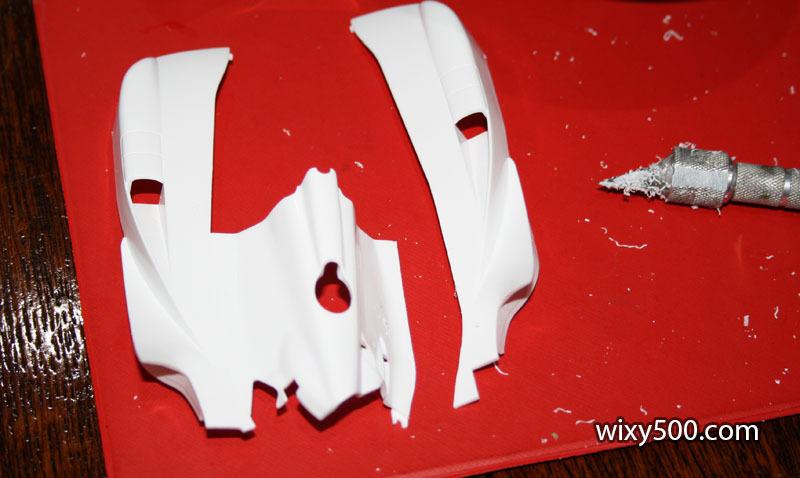 Debris mesh for the turbo intake is cast in clear, which requires masking and painting. 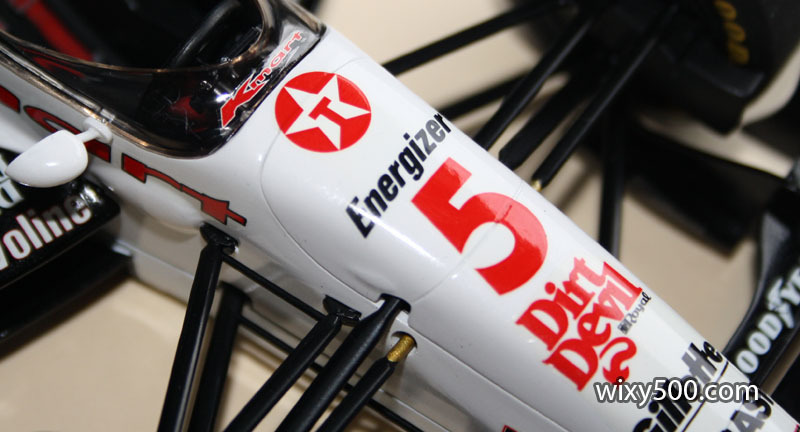 It also involves careful application of the big engine cover decal (yep, Energizer, Gillette, BASF and Dirt Devil is all one decal – most of it goes under the cover, but some is on the outside). 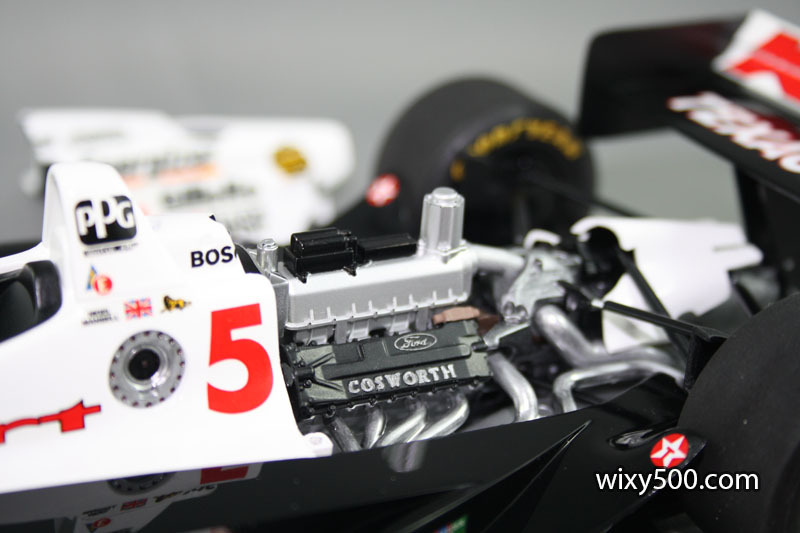 Hand painting of Ford and Cosworth on the rocker covers was poorly done. Must have been a bit shakey that day! 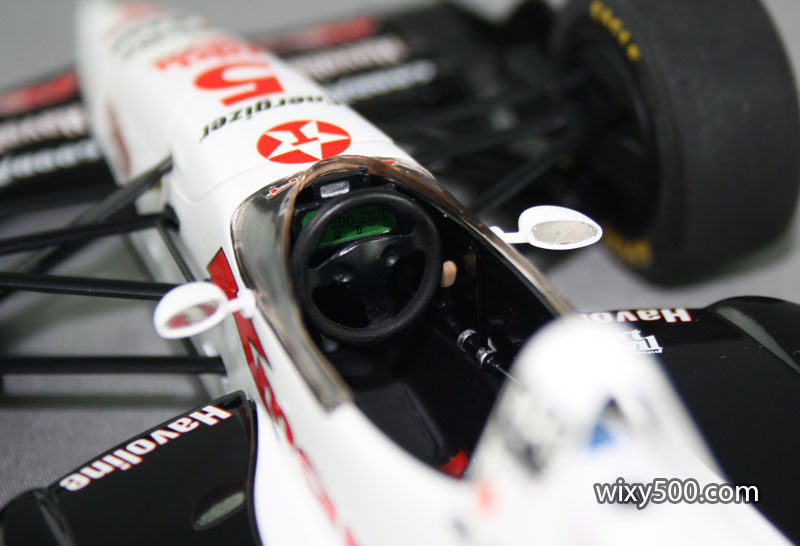 Some cockpit detail. 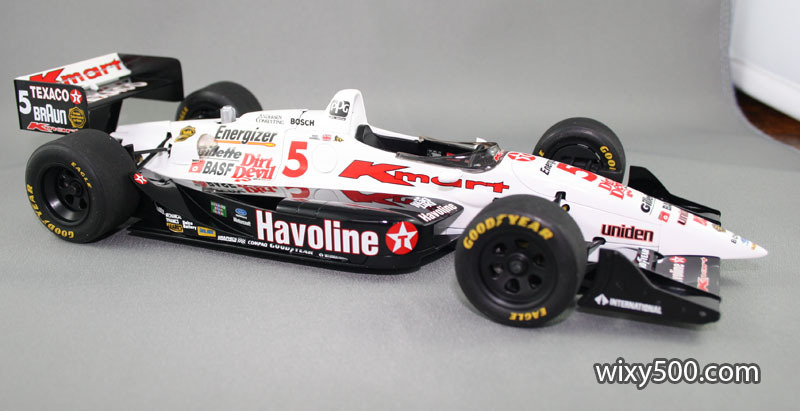 I remember watching Mansell on TV buzzing up the engine doing waaay early downshifts on the road courses. 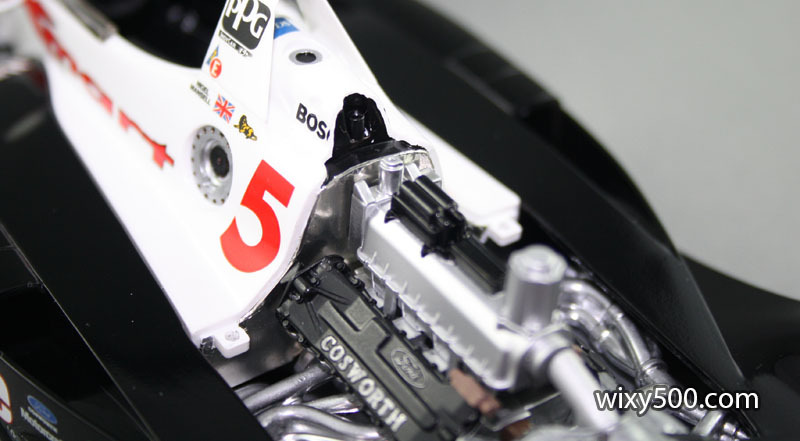 Oops, didn’t fit the engine cover down properly for this photo. There is a bit of a gap due to the cut I made, but it’s not *that* big! 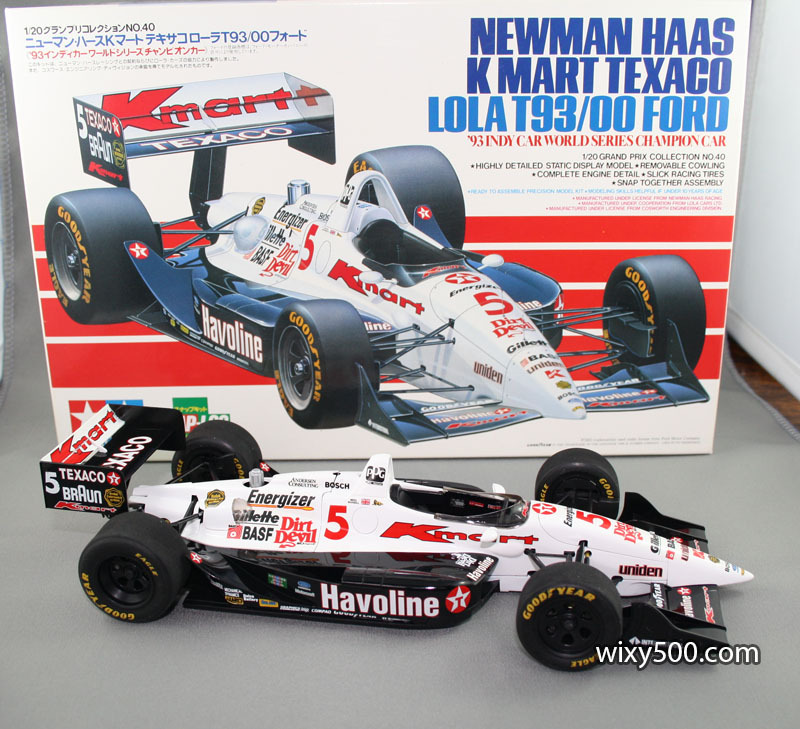 My completed model Vs the Tamiya box art.